This design combines all sorts of interface elements in a neat display. With a spinning globe, scanner and equalizers. A cool high tech video loop! This video loop works perfectly as a motion background, great for all kinds of video presentations. 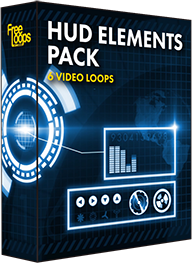 This video loop is part of HUD Elements Pack.